Rubber Bracelets to Support Emotional Regulation? Absolutely! Wendy Turner teaches 2nd grade at Mt. Pleasant Elementary School in the Brandywine School District in Wilmington, Delaware. She is the 2017 Delaware Teacher of the Year and an Associate with Education Hall, providing trauma-invested and social emotional learning professional development for Kristin Souers and Pete Hall, authors of “Fostering Resilient Learners” and “The New 3 Rs: Relationship, Responsibility and Regulation”. Monday morning arrives. Victor approaches the classroom door with a scowl on his face, his hands balled into fists, jawline tensed with stress. I greet him with my usual eye contact, firm handshake and cheery “Good Morning.” I am not surprised when he is unable to return the greeting. I let him enter the classroom without belaboring the point, understanding that he is in a difficult place and that getting into a struggle over anything at the moment would be counterproductive, even damaging. Slowly he walks over to a small container filled with different colored rubber bracelets with a sign on it that reads, “How are you feeling today?” Choosing a red one, he slides it onto his small wrist and stomps around the classroom as he places his folder in the collection basket and shows me his agenda. I now understand he is on “red,” the most difficult emotional state he can non-verbally communicate to me first thing in the morning. Students continue to stream into the sunny classroom. Some notice his red band and have a look of concern on their faces. A few moments later I ask Victor if he is ok. Stomping his feet, he firmly says, “NO OF COURSE NOT!” I ask him if he can tell me about it, and the story unfurls quickly as tears well up in his eyes. “I forgot it was dress down day and came in my uniform and I don’t have a blanket for the summer reading picnic. AND I ate breakfast early with my dad so now I am STARVING!” I nod, relating that all of that would put me on red too. I ask him if he would like to go out into the hallway to get breakfast and restart the day. He nods tentatively and walks towards the door slowly. In a few minutes he returns with a bag breakfast and starts to eat at his table. Morning work stays unfinished but that is OK because in this moment, I know my biggest job is to help Victor recognize and navigate his big emotions. We start morning meeting, he finishes his breakfast quietly, as others do in the circle, seeming to relax with every bite and each passing second. When it is his time to participate in an activity with another student, he is able to do so. At the end of the morning meeting, we move into mindful breathing for a few moments to set the tone for the day. Watching, I see some of the stress leave his face and comfort move in and take over. Pride for Victor swells inside me and he changes his rubber bracelet to yellow before lunch. I don’t think students can unlock their full academic potential until they unlock and understand their full social emotional selves. A significant part of this journey is working towards emotional regulation, the first step of which is identifying one’s emotions. We must find creative and powerful ways for students to do just that in our classrooms! Using non-verbal signals is an easy and powerful way to do so. The first step is teaching kids how their brains work, the science behind what is happening when we experience different emotions. Utilizing Dr. Dan Siegel’s hand model of the brain is a great place to start. Here he explains the model and what is means to “flip your lid.” This video does a nice job of explaining to kids what is going on in their brains when they lose control of emotions. Using tools and ideas such as these normalizes all emotions including negative ones! There are no bad emotions, just difficult ones and if we know what to do when they come, if we have a plan, we can deal with them! Connecting to emojis works well with kids of all ages because they are part of our daily lives. 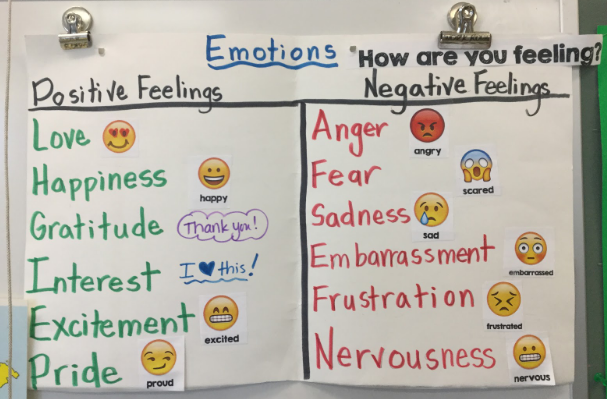 I love to bring conversations around emotions into the classroom in various ways. Literature is a powerful tool for any age and students love to connect to how characters are feeling through discussion and analysis. In elementary school classrooms, try Lilly’s Purple Plastic Purse or The Color Monster for K-2 and The Name Jar, Harry Potter, or Wonder in grades 3-5. At the middle school level, great selections include Wonder, The Percy Jackson Series, or The Giver series. In high school, The Hate You Give works well, as do books by John Greene. At all ages, sharing narrative writing by students themselves offers a great opportunity for connections and discussion. My students put on a rubber bracelet each day to tell me about their emotional state without saying a word. They can let me and others know how they are feeling in a simple and powerful way and can even change their bands throughout the day. I make a point to check in personally with any student on red, they are free to tell me what is going on or not. I also realize that what means red for someone may be another person’s green or yellow. When we are aware of emotions without judging them, we are empathetic. We do an emotions check in at the end of our morning meeting each day. This is a valuable opportunity for all of us to notice how we are doing individually and collectively and think about ways we can support each other. It breeds awareness and a culture of empathy at the same time. I have seen students change their bracelet from green to yellow because one of their buddies is on red! I have seen a child put on a red bracelet because no one is listening to him or her in a group discussion. When others see the red bracelet they stop and listen! This can work for all ages. I wear one every day as well and have changed my bracelet in front of my students to model how I handle my emotions. Students need tools to identify and work to understand and control their emotions so they can be successful both inside and out of school! We need a plan for how we are going to do this. Using the hand model of the brain, literature, and rubber bracelets is a great way to start. You can buy rubber bracelets in youth and adult sizes here. Let me know if I can help you begin your journey! Contact me at wendymturner@gmail.com or find me on twitter @mrswendymturner. Older PostHealthy Brains? It’s up to you!